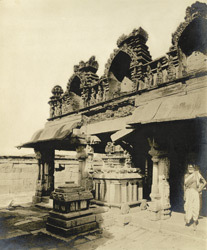 Photograph of a corner of the main mandapam and the stone ratham of the Chennakesavasvami Temple at Somapalem, Cuddapah district, taken by a photographer of the Archaeological Survey of India around 1900-01. This Hindu temple was built in the 16th century during the Vijayanagara period. In front of the unfinished pyramidal tower of the gateway stands a monolithic lamp-column 18 metres high. Its shaft is carved with scrollwork motif. The interior of the temple is very ornate. The columns of the porch or mandapa before the shrine are richly carved with figures of the divinities and the brackets have pendant buds. The mandapa is overhung by a double-curved eave surmounted by a brick and plaster parapet. Next to the mandapa stands a stone ratha or chariot.